Sending generic emails to your whole team to address an individual performance issue is an ineffective way of dealing with a problem. Have you ever received a random email from your manager with a generic reminder about how to submit your expense report, or something along that line? You probably read it and checked in with the boss right away to see if you were doing something wrong. The boss assures you you’re fine, it was just a general reminder. Trust me, it wasn’t. Managers aren’t sitting around with nothing better to do than send out random reminders about processes. Someone prompted the action. The problem is that the person who caused the problem won’t know the reminder is directed at them and everyone else on the team will ask the manager if it was them. The problem persists and a lot of time is wasted fielding questions from the people who aren’t creating the problem. On a similar note, don’t make generic announcements in your staff meetings. The result is the same. The answer to the question ‘Can’t you read the sign?’ is no. Go check out the common areas in your workplace, the copier and break rooms are good places to check. See any signs there? The most common sign in the break room is ‘Clean up after yourself, your mother doesn’t work here’. Or, ‘Put all items back where you found them’. Despite the signs the problems persist. The problem with posting signs is that the writer of the sign assumes the offender is knowingly violating the unspoken rules. Consider this, if they don’t know what they’re doing wrong, how will they know the sign is directed at them? Case in point: this sign was posted on top of a microwave in a break room at an office building in Anyoffice, USA. Can you feel the rage emanating from this sign? 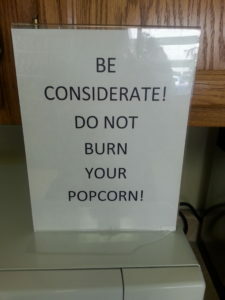 The author of this sign clearly assumes that someone burns their popcorn on purpose. The funniest part was the nearly identical sign on top of the microwave that was next to this one. Signs generally don’t work because no one reads them. No matter how large or bold the font, or how many exclamation points are used. Another common method manager’s use to deal with problems is to ask HR to update the employee handbook. These requests are usually related to uncomfortable personal situations like dress codes and use of fragrances. Or, the more common problem plaguing workplaces – cell phone use. This method is probably the least effective of the three. Sorry HR, no one is reading the employee handbook. I know, I know. They signed off on it acknowledging they did. A 2014 survey from GuideSpark revealed that 61% of millennials did not read any or all of the employee handbook. Even if they do read it, the chance they noticed the updates to the dress code section are slim. I frequently conduct informal, un-scientific surveys when I’m training and one of the questions I ask is ‘How many of you have read your employee handbook?’ The no’s make up way more than 61%. And my audiences are managers. Trying to get your point across in the employee handbook won’t solve the problem. Managers can save themselves a lot of time and stress by dealing with the problem directly. Yes, talk to the individual instead of sending out mass messages that won’t get heard, read, or seen. How do I know most managers aren’t already doing this? Because I talk to them every day about the realities of the workplace and the realities are the same all across the country in industries of all types and sizes. Plus, I’ve been a manager and I’ve had managers and I can definitely say we all have opportunity to improve in this area. There you have it. A simple, direct approach that works better than generic emails, signs, or updating the employee handbook. Give it a try and let me know what you think. Check out Communicate Like a Boss and the Smart Leader System© for step-by-step instructions on how to develop expectations. Liz Uram is a leadership development speaker and creator of the Smart Leader System©. Providing practical tools for getting results and creating high performing teams.